You've been promoted and your salary has been increased. But hang on. Before you start celebrating with your friends, let us give you a good advice. Congrats! Your hard work has finally paid off. You've been promoted and your salary has been increased. But hang on. Before you start celebrating with your friends, let us give you a good advice. Use your promotion to climb up the career ladder and improve your financial health. A pay raise can be a curse in disguise if it is not utilized properly. 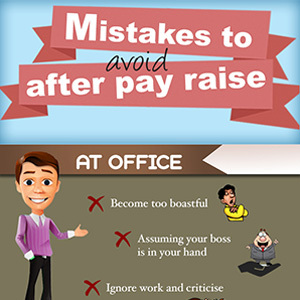 Here is an infographic that will help you understand the mistakes to avoid after a pay raise. Read more: How to Save Money at Your Work Station? Read more: Why benefits are more lucrative than higher salary?